Plans for a unified San An Promenade linking the entire Portmany Bay took a step closer to realisation today. The mayors of Sant Josep, Josep Marí Ribas Agustinet , and Sant Antoni, José Tur Cires, have participated today, together with technicians from both town halls and Ibiza Consell in a working meeting to plan out the major civil engineering project of San Antonio Promenade. This project foresees an investment of 20 million euros in different initiatives aimed at the recovery of the entire coastline. 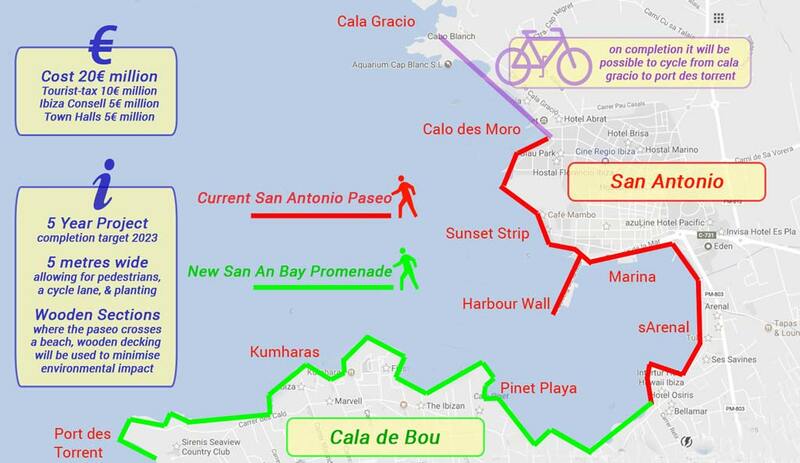 The proposal is to provide a single continuous promenade for pedestrians and cyclists extending from Cala Gració to Port des Torrent. The project also includes the renovation of sanitation infrastructures, the renovation and expansion of existing docks to improve maritime traffic, and works to minimise the visual impact of existing pumping wells. The project is co-financed with the majority of money coming from the tourist tax, with contributions from Ibiza Consell and the two town councils. The meeting has defined the timeline and steps required between the administrations involved, in order to fulfill the complex project that affects both municipalities. It is expected that the final green light will be given this autumn. Then the commission for the management of the project will be given to Sant Josep, within which the majority of the works will be undertaken. It has been agreed to create a management office to coordinate the entire project given its scope and complexity. The objective is to start the works in the second half of 2019.